Wang Xizhi, whose ancestors were from Linyi in Shandong, moved to Guiji in Zhejiang at the end of the Western Jin period. He once served as General of the Right Army and as Prefect of Guiji. He was known, however, more for excelling at regular, running, and cursive script calligraphy, studying their features in depth to create an elegant style of unparalleled beauty, which is why later generations referred to him as the "Sage of Calligraphy." This piece is an exquisite copy of three short letters by Wang Xizhi using the method of "double outlines filled with ink." Particular attention was placed on the wisp-like traces of the brush, faithfully reflecting the beautiful features of Wang Xizhi's calligraphy. 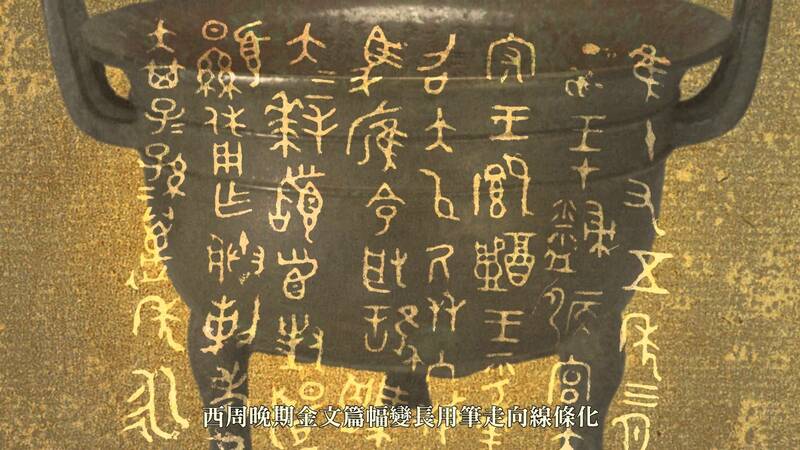 In addition, even the ciphers of previous connoisseurs were copied, providing evidence for the method of collecting from the Southern Dynasties to the Tang Dynasty, when this copy was made. The monk Huai-su, originally going by the surname Qian and the style name Cangzhen, was a native of Changsha (or Lingling) in Hunan. Achieving renown in his hometown for cursive script, he later headed north to Chang'an, where famous people at the time presented poetry in admiration of his calligraphy. 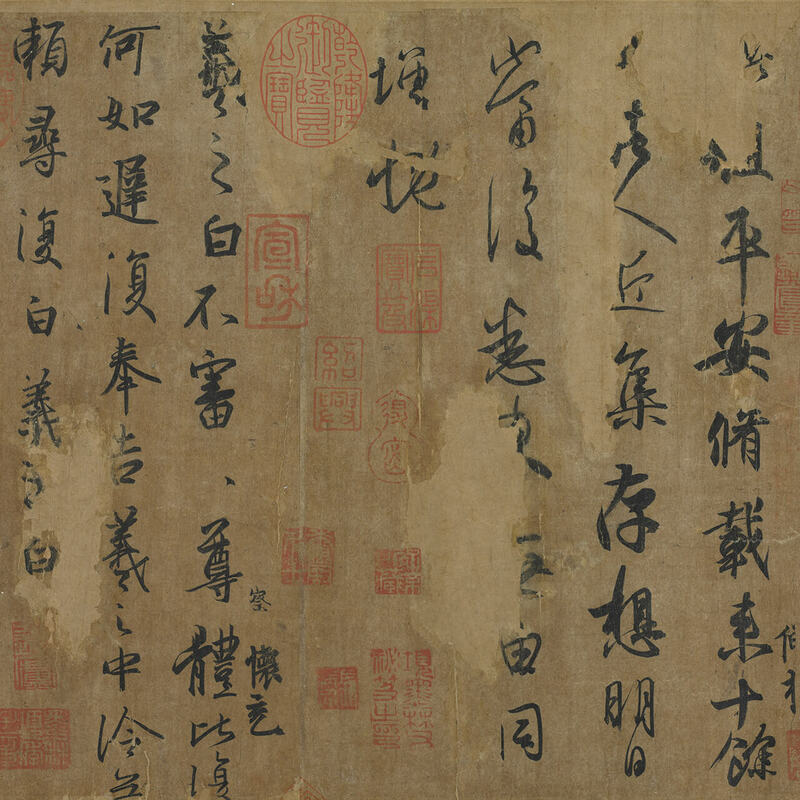 In the "Dingsi" year of the Dali reign (corresponding to 777), he transcribed these verses of praise along with a preface by the master calligrapher Yan Zhenqing to compose this handscroll. 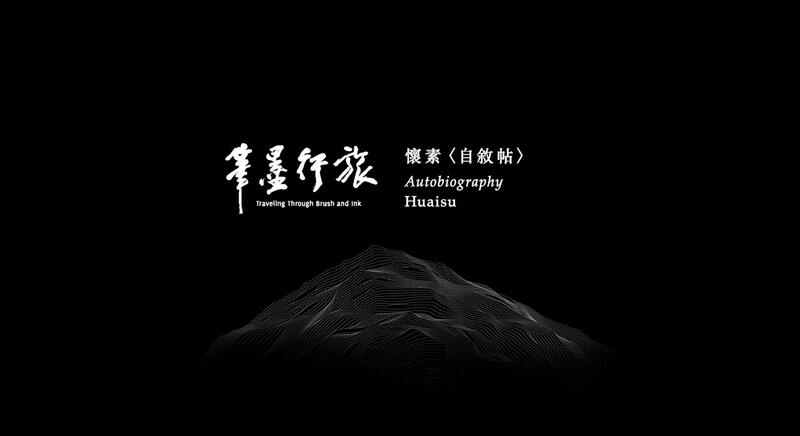 Some of the lines here refer to natural phenomena or use exaggerated phrases to describe the beauty of Huai-su's cursive script. Other passages praise him as an inheritor of the "wild and crazy" cursive script of Zhang Xu in his pursuit of unusual and unbridled qualities. The entire work was done with fine yet strong brushwork, the features continuous throughout for an unlimited range of unusual expressions, making this the ultimate in the art of cursive script. Among the leaves of the trees in the lower right part of the mountain forest is the signature for "Fan Kuan." 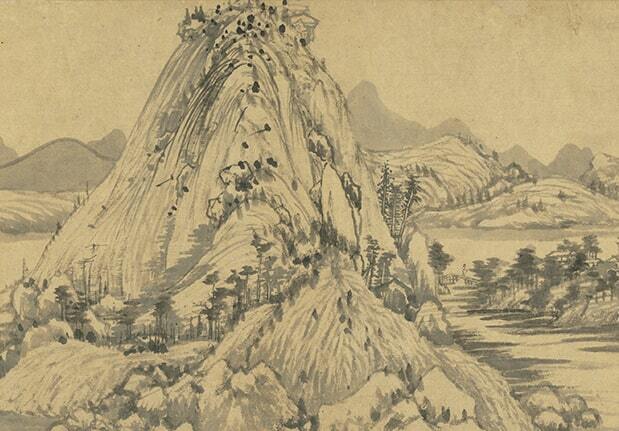 A native of Huayuan (modern Yaoxian, Shaanxi), Fan Kuan (style name Zhongli) excelled at landscape painting, at first studying the styles of Li Cheng and Jing Hao and, because of his long years observing nature, he was able to create a style of his own. The composition of this painting is succinct; the foreground consists of large rocky outcroppings in the lower center, the middle ground reveals a line of donkeys, and in the distance stands a towering mountain. The foot of the peak has been left blank to suggest a band of clouds and mist, highlighting the effect of distance and height in the space. Angular strokes outline the forms throughout the work, to which short brush texturing was added to give substance to the landscape forms. The contrast between the monumental peak and the small train of donkeys here express an absorbing aura of majesty. Ni Tsan painted this work in 1372 during the early Ming Dynasty, two years later inscribing and presenting it to the physician Pan Renzhong. Then already in the Ming Dynasty, Ni Tsan had given up his family property and led a life of wandering the waters of the Lake Tai area for almost twenty years following the chaos of the late Yuan. This painting depicts the scene of a river with its two banks. The foreground sloping area is slightly more expansive, but the empty kiosk makes it appear even sketchier. More than twenty years earlier, Huang Gongwang pointed out the appearance of Dong Yuan's style in Ni Tsan's "Six Gentlemen," now having become a more refined and tempered form of visual vocabulary. "The Master Wuyong Scroll" version of "Dwelling in the Fuchun Mountains" is composed of six joined pieces of paper and measures more than six meters in length. The first section of paper has traces of damage where repairs were done. Suffering from fire in 1650, the first part of the scroll was cut off (and now is in the Zhejiang Provincial Museum collection). Together with his Taoist friend Zheng Wuyong, Huang Gongwang in 1347 returned to Fuchun, starting this handscroll and completing it three to four years later. The painting features layers of brush and ink, the landscape forms outlined and washed with great variation. The mountain shapes throughout the scroll range from rounded ones up close in layers stacked to the back to gently rolling slopes and banks, and even lofty peaks, revealing a rich variety to the landscape pattern. 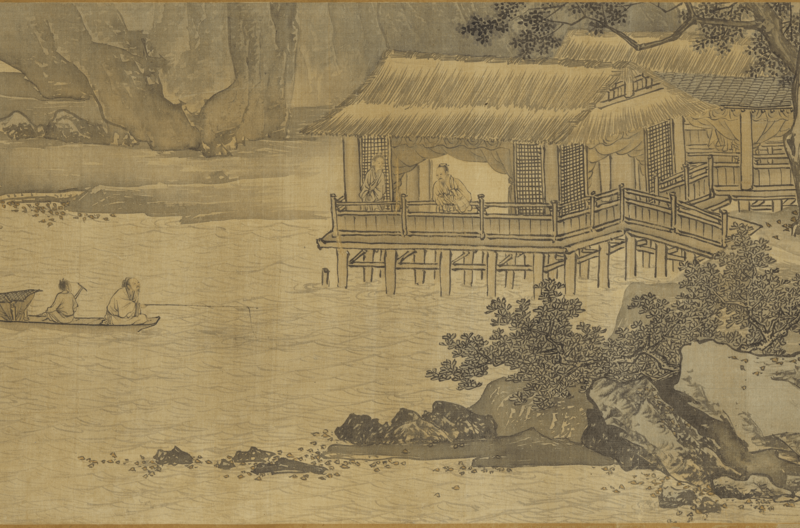 This handscroll painting not only represents scenery of reclusion in Fuchun, it even more so reflects Huang Gongwang's idealized image of the landscape transformed through his exploration of nature. 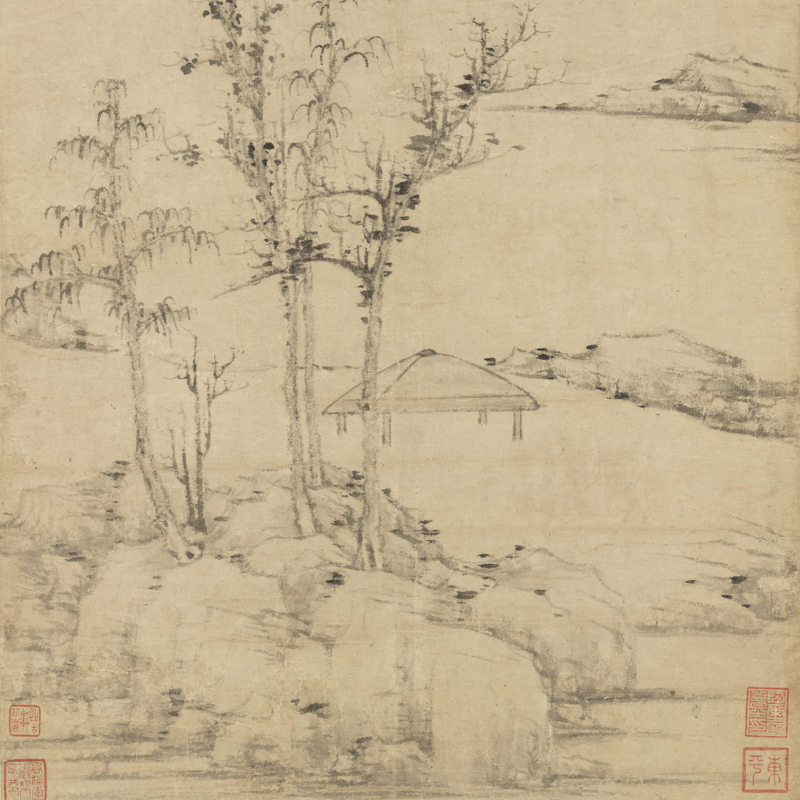 This handscroll painting depicts pine trees, red maples, and yellow leaves against a waterfall and flowing stream with thatched cottage and water kiosk buildings scattered among rocky banks. Figures kneel to each other for a drink, leisurely hold a staff on a walk, lean on a railing to observe fishing, or play a flute with feet in the water for a carefree existence. The mountains combine "hemp-fiber" and elongated "axe-cut with water" texture strokes, the rocks rendered with washes of mineral blue and ink. The places in sunlight are left blank to suggest the light and dark of uneven surfaces for a volumetric effect. The leaves are painted in the outline method with washes of cyanine blue, cinnabar red, and gamboges yellow added for a beautiful and colorful manner. The brush and ink throughout is also exceptional, the scenery even more marvelous. 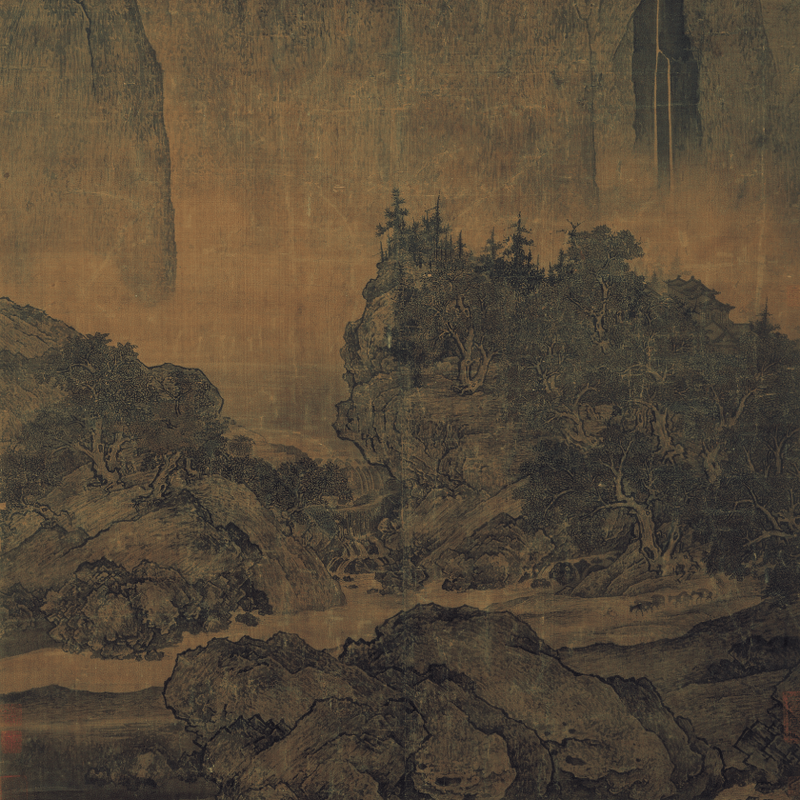 Tang Yin's inscription on the painting includes the line, "In times of peace heroes drop their guard," expressing aspirations that filled his heart but also indicating that people of talent had no chance to demonstrate their abilities. 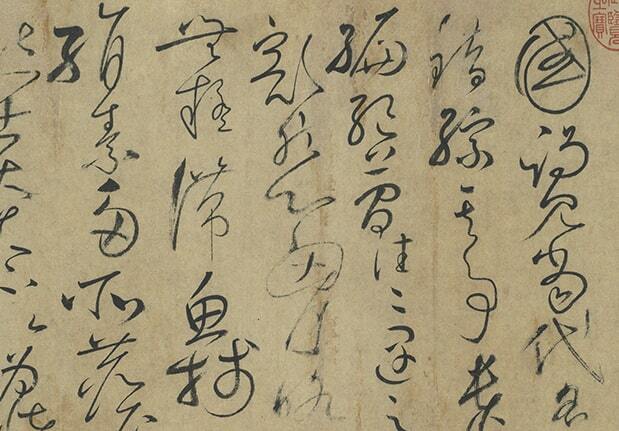 Such students of Wen Zhengming as Lu Zhi, Cheng Dalun, Gu Deyu, and Ju Jie all wrote inscriptions at the end of the scroll, and the inscription by Wang Chong was composed in the spring of the second year of the Jiajing reign (1523). The tradition of depicting fish swimming among plants in water goes back as far as the Song Dynasty (960-1279). However, here it differs from the rendering of aquatic plants and fish done by Giuseppe Castiglione. He enlarged the size of the fish and positioned the plants on the surface of the water as below the larger fish, creating an unusual visual effect that makes the two large fish appear to be floating in the air. Judging from some markings in the plant patterns near the edge of the painting, this work may have originally been glued to the surface of a palace wall and then later removed and remounted as a hanging scroll.